North Of London, Brexit Supporters Gather To 'Feel Proud And Unashamed' The Leavers of Lincolnshire group aims to provide a safe space "so you could come together and be proud to be a Brexiteer," says a member. "To not be called an idiot, to not be called a racist." Will Grover, a local councillor in Lincolnshire, tells pro-Brexit voters in the village of Horncastle that they should be proud of voting to leave the European Union. Grover says Brexiteers can feel stigmatized for their views, and he hoped the gathering might provide a safe space for some Brexit voters. "Are you angry?" yelled Will Grover, a councillor with Prime Minister Theresa May's Conservative Party. "Yes!" yelled back the mostly older crowd. "You should be," said Grover, "because your voice, your vote, is being betrayed. They do not respect you. Why should you respect them?" Grover and several dozen others were venting their anger at Britain's parliamentarians over the U.K.'s failure to leave the European Union nearly three years after they voted on the Brexit referendum. 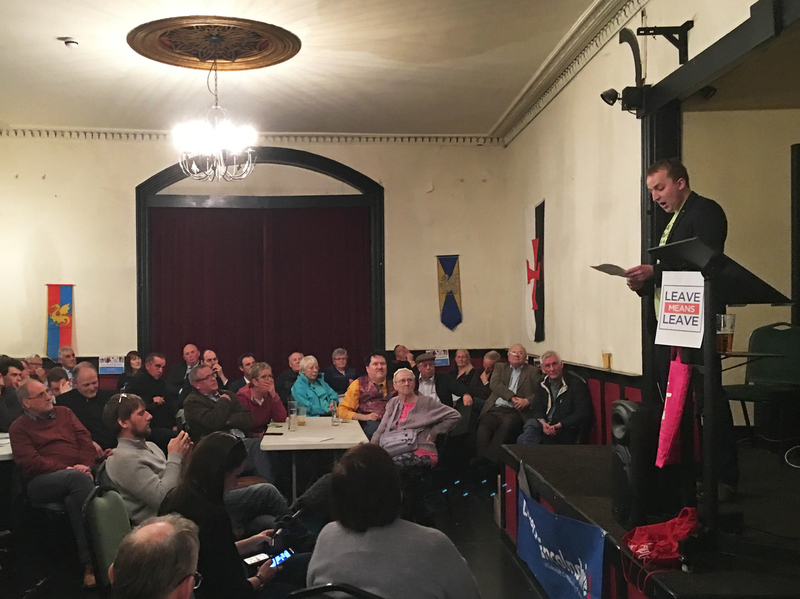 Grover was speaking at a "Leavers of Lincolnshire" get-together last Thursday in Horncastle, a village of about 6,000 in the English Midlands. It's a local chapter of Leavers of Britain, an organization that describes itself as "an online AND offline community bringing like-minded people together across the U.K."
Brexit voters are furious these days. The U.K. was supposed to wave goodbye to the EU last month, but now may not leave until Halloween. British politicians can't agree on how to exit the political union and trading bloc, and Parliament has been paralyzed for months. Seventy percent of people in this part of Lincolnshire county, about 140 miles north of London, voted to leave the European Union. Some in Lincolnshire say they voted to quit the EU to halt an influx of farm workers from eastern Europe; others say they want to take back control of lawmaking from Brussels. 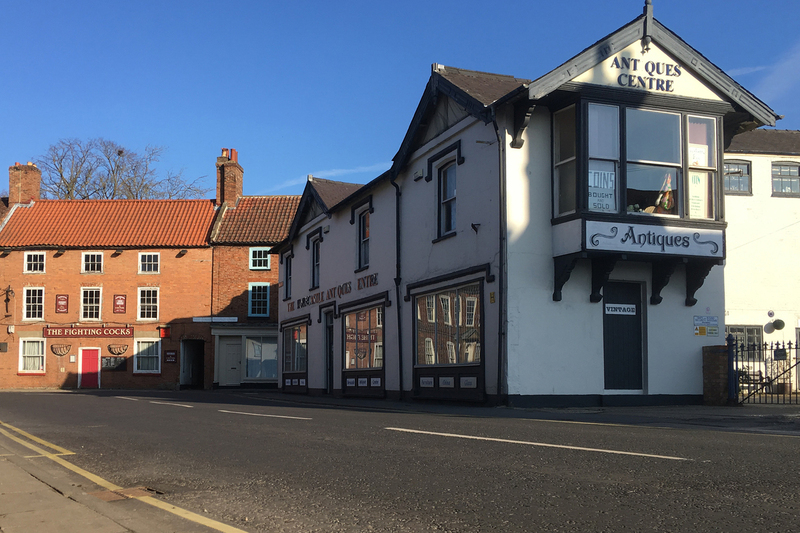 Horncastle is a quiet English village about 140 miles north of London. Seventy percent of people in this part of Lincolnshire voted to leave the European Union. Grover says Brexiteers are often derided as gullible xenophobes and feel stigmatized for their views, especially in areas with heavy pro-EU support, such as London. Grover said he hoped last Thursday evening's event might provide a safe space for some Brexit voters. "So you could come together and be proud to be a Brexiteer," said Grover. "To not be called an idiot, to not be called a racist, to not be told you didn't know what you were voting for. This is for you to feel proud and unashamed of your views." Alfie Thomlinson, a 19-year-old student, took the stage and talked about what happened as he was handing out leaflets to counter the launch of a Remain group on campus. 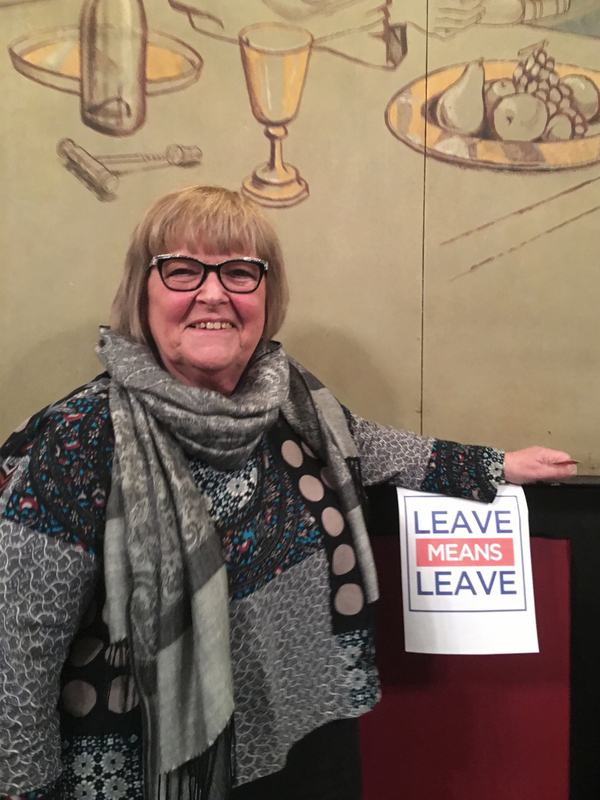 At the Leavers of Lincolnshire meeting last week, "We didn't know anybody ... and we started to talk and we all felt the same," says Peggy Reading. "That was absolutely great. We can breathe." About 52 percent of U.K. voters supported leaving the European Union in the 2016 referendum, while 48 percent voted to remain. Peggy Reading, also attending the meeting, blames the prime minister for the failure to deliver Brexit and says the political debacle has left her disillusioned with British democracy. "Nobody takes any notice of us, so why should we vote?" said Reading, who added she thought politicians were ignoring Brexit voters. "It's been shoved under the carpet. They [think they] know better than us. We're all thick, stupid — and that is not true." Reading says that she keeps her pro-Brexit views mostly to herself. She's worried if she speaks up at her workplace, she will be ostracized. She can't remember a time when her country was this divided. At the Leavers for Lincolnshire gathering, she found the evening with fellow Brexiteers relaxing and comforting. "We didn't know anybody ... and we started to talk and we all felt the same," said Reading. "That was absolutely great. We can breathe." Producer Kerry Alexandra contributed to this report.